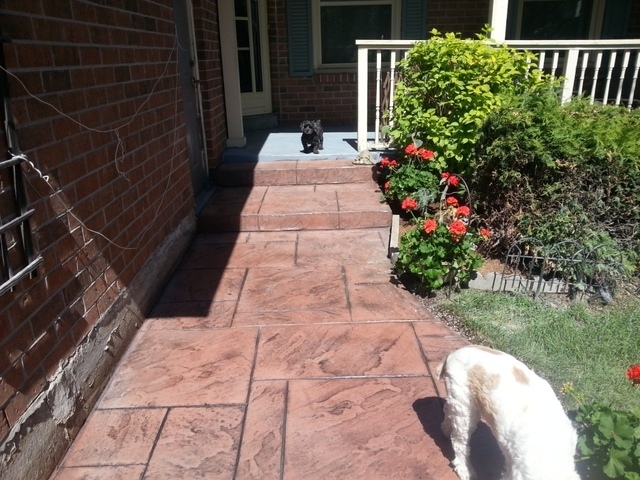 My husband and I were interested in improving the approach to our house by replacing the existing stone walkway and steps onto our front porch with stamped concrete. The advertisement in a local paper for CFB Impressed Concrete Inc caught our attention and after reviewing their website we contacted Frank to arrange for a quote. Frank and his people did an excellent job. They completed the job within the projected timeframe and were very neat while going about the work. We are very happy with the result and feel that it’s increased the appeal of our home. It’s exactly the change we were after. My husband and I inherited a chesterfield and love seat 11 years ago. The furniture was well-loved when we got it and was comfortable in our rec room; however we had always intended to have it reupholstered at some point and move it into the living room. At Newmarket Home Show this year we met the rep from Classic Touch Upholstery and were so impressed with their attitude and the information they provided to us that we immediately arranged for a free in-house estimate on our project. The sales-rep who came to our home was well informed and helpful. She provided us with all the information we needed to proceed and we didn’t feel at all pressured, it was a very relaxed meeting. Of course we wanted the ‘new’ furniture to fit in with our existing chairs and the sale-rep made the whole process of choosing material etc. for our project painless. The pickup and return of the furniture was handled smoothly and as expected. One minor thing came up during the project and Anna phoned to explain the issue to us. She ensured that we understood our options and obtained our approval before proceeding. This minor change didn’t affect the price. The ‘new’ chesterfield and love seat are now in our living room and we’re so pleased with how they look and feel. Maria even made us 2 throw cushions to finish off the look of the room. We couldn’t be happier with our experience and would have no hesitation in recommending Classic Touch Upholstery to our friends and neighbours.